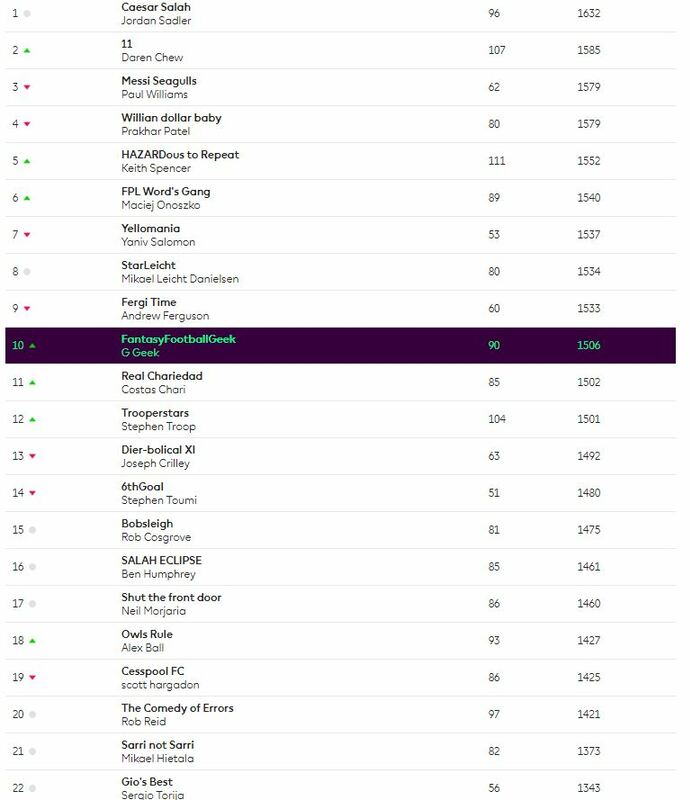 It was an excellent double gameweek for me, taking me to my highest OR of the season of 1055th. The huge score from my captain Aguero really helped boost my rank this week alongside the other 6 returners in my squad. 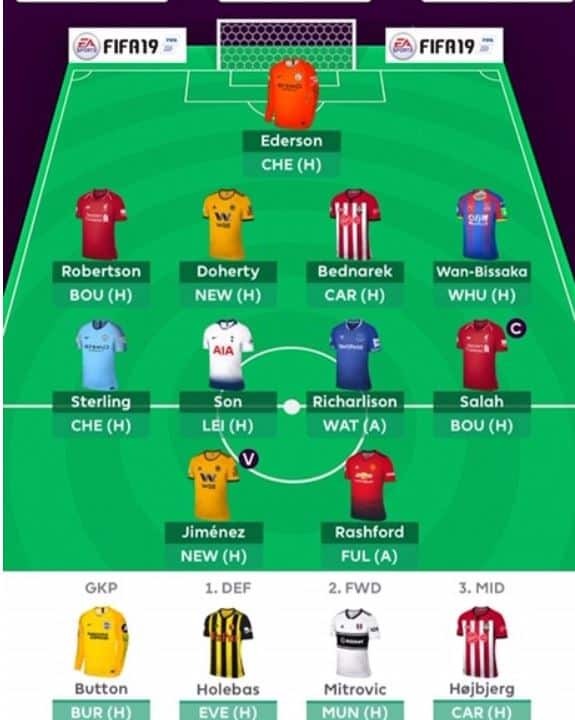 My returners were Aguero 38, Luiz 13, Jimenez 9, Silva 8, Pogba 7, Rashford 7 and Doherty 7. I was very disappointed by my 3 Liverpool blanks versus West Ham. Since I brought Alisson in to double up on the Liverpool defence 4 weeks ago they’ve only managed the one clean sheet which really isn’t good enough. That’s now only 1 clean sheet in the last 6 weeks for Liverpool so that double up may be something I’ll have to consider soon if it doesn’t pick up. My other blank was Richarlison though I’m not too surprised at that looking at Everton’s recent form and the fixtures he had, regardless of him having two. 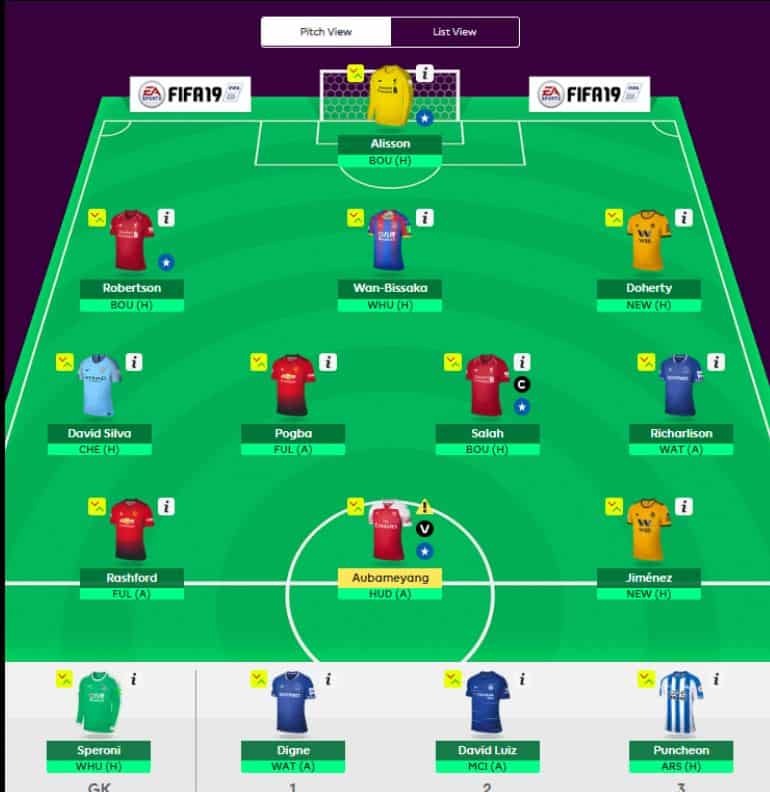 I did get the 50/50 between Sterling + Wan-Bissaka and Silva + Richarlison wrong in regards to this week, but it only was a 5 point difference and that can easily be made up for this week by having Silva + Richarlison playing this week over Sterling + Digne. Silva actually performed really well in both games and easily could have had more returns so I’m content with my choice. 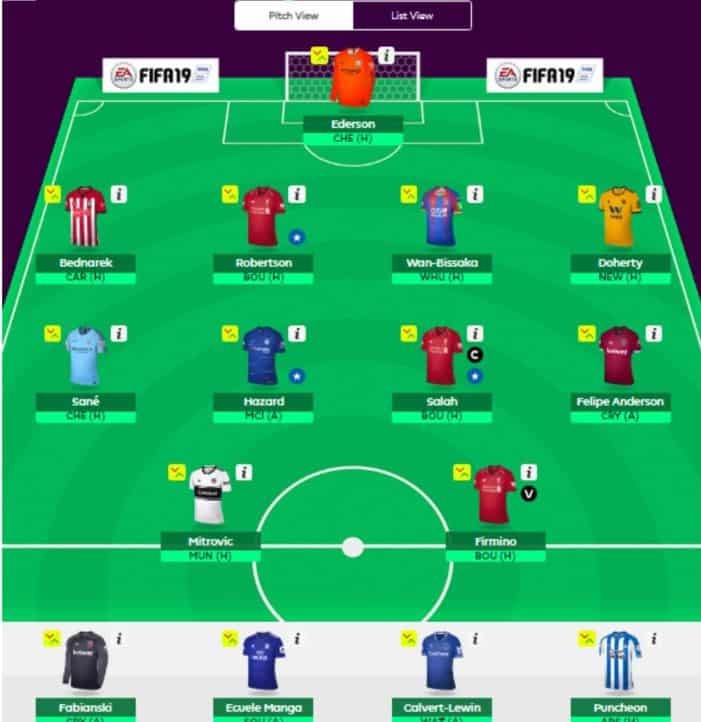 Simple transfer for this week: Aguero out, Aubameyang in. The masses decided to sell Wednesday night stopping Aguero’s price rise that was about to happen so lost some potential value there but oh well. The plan for GW27 is to transfer out Silva for Son and then that leaves me with the 11 players I need. I’m not particularly happy about my team for GW27 due to me having two Man United forwards and 2 Liverpool defenders but I’m sure quite a few people are in a similar position for that week. My first sub for this week is Digne versus Watford away as I can’t see Everton keeping a clean sheet and I’m still a bit bitter about the -2 he gave me the other week. My second sub is Luiz due to him playing Man City away. Finally, my third sub is Puncheon versus Arsenal at home. I’ll most probably be captaining Salah for this gameweek. Bournemouth vs Liverpool is normally a high scoring game with Liverpool scoring 18 in the last 6 times they’ve met and Salah scoring 5 in the last 3 times. Transfer summary: Aguero out Aubameyang in. Another poor gameweek for my team and I place the blame squarely at the doors of Pep Guardiola and Leroy Sané following the latter’s single point performance during the double gameweek. Naturally, I had placed the armband on him which severely hindered my score resulting in a significant red arrow despite 7/11 returners. Strangely enough, the four players who blanked comprised of two double gameweekers and two Liverpool assets. I had decided against bringing in Aguero due to the fact that he only had two double figure hauls all season and it would require a -8 to bring him in. The only saving grace was that avoiding him meant keeping Hazard but that was a minor positive crumb on a plate of misery that I’m hoping to bounce back from. 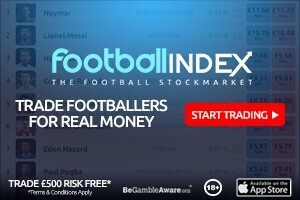 Looking at my team, there are three potential problems in Sane, Hazard and Richarlison with two obvious transfer targets that I would like to bring in – Son and Aubameyang. After his midweek performance, it was impossible for me to not remove Sané and bring in Son so that move was made almost immediately and I’m sure that I won’t be the only one making that move! The Spurs man has been in scintillating form and I have been highly impressed with how he has stepped up in the absence of Kane which I fully expect to continue. Turning my attention to Aubameyang, who is the obvious captaincy candidate in the gameweek after this and whose sacrifice would have to be Hazard. With Chelsea facing a trip to the Etihad this week, I have contemplated making the swap for GW26, but it seems excessive when a -8 would be required. The news that Aubameyang was suffering with illness on Thursday has given me enough confidence to hold off on this move for now, but it will likely be made next week and presumably after a haul from the Arsenal man! That leaves Richarlison who is having a case of déjà vu with his performances dropping significantly in the second half of the season again. There are potential replacements in Jota and Anderson, but with the Brazilian being rested midweek and facing his former side this weekend, then it’s another move that I’m happy to wait on for now. Salah is up against Bournemouth at Anfield on Saturday which makes it an easy captaincy decision despite blanks in the last two weeks. I’m expecting a big victory for the Reds at the weekend given the away form of Bournemouth and their injury situation – hopefully Salah can have a prominent role! Best of luck to everyone this weekend and may your arrows be green! After a pretty decent double game week with 80 points, this is how the team stands. The priority is to get rid of players having a blank in GW27. Hazard has City away so he makes way for Son this week who looks unstoppable. Captaincy is a tough one but you just can’t look past Salah at home to Bournemouth.The only bench decision I am yet to make is Holebas vs Wan-Bissaka but for now it is Wan Bissaka. I’ll update the team on Twitter before the deadline. Good luck everyone and may your arrows be green! Transfer summary: Hazard out Son in. So this was my worst GW of this season. Most of the contributors and most of my cash mini league leaders went with Kun for this DGW (some even pushed the TC chip). That was the obvious thing to do, especially when I could do a straight swap of Auba to Kun without a hit (a lot of managers did the Kun for minus 4!). I choose to keep Auba thinking Kun will start only the first game. I really didn’t expect his hat trick. I’m guessing that if he had only one game vs Arsenal he wouldn’t have been such a captain favourite but that was my bad call. I captained Richarlison. My friend Omer Reshef laughed at me and told me Richarlison will get 3 /4 points. I should have listened. I was sure he would play 180 minutes (all at home). By my calculation he had around 70% to return at least one time using the odds. I therefore thought there was a good change of double figure points. So I kept 2 FTs to prepare better for DGW27. The plan failed unfortunately. Kun started in both matches, was brilliant in the first one scoring an easy hat trick (although the last one was with his hand), while Rich didn’t shoot even once vs Wolves and even didn’t start vs. City! So it was a big lost of 33!!! points not bringing in and captaining Kun (19*2+3 VS 3*2+2). A loss that can almost cost a whole season. I got 53 points and rank of 4.4 million, and that’s instead of 86 with 800k rank, but lets move forward. Of the 9 remaining players players, and except my 3 Liverpool players (I needed a CS so much) all the other 6 returned, usually I could have a nice GW, but it was all about whether you KUNed or not. So let’s finally move forward to GW26, with 2 FT , I wanted to start get rid of the blank players of GW27. I didn’t have any City assets as you understand, I had Alonso, Richarlison and Digne, the tougher game for both teams was Chelsea vs City, so I went with Alonso out and Richarlison out who just seems way out of form. I brought Son back in (the same Son that I took out too early previously, and who now plays as a striker). He’s in amazing form and has to be in. I also bought in Kolasinac who has 3 nice fixtures ahead with a good chance for attacking returns. There’s even a chance for Arsenal to keep a CS somehow! I did early transfers because of Son’s early rise in price and I used exactly all my money to do the trade. So I have very nice squad for this GW and I hope I will be able to climb back up the ranks. My main target is still the same and that’s finishing in the top 10k. This week I dropped from 17k to 34k and need to climb back step by step. Tough calls as all of my players have good fixtures this GW. I’m choosing to keep Shaw on the bench. He should have got 3 bonus points last week except for a yellow card. However 3 other defensive starters in Kolasinac and Robertson are in way better attacking form. Doherty with a brace and assist in mid-week cup game. My other 2 on the bench are Deulofeu who started to slow down his form and also started to go down in his minutes and Digne is the third sub due to Everton bad form. I have 2 flags with Auba (Sick?) and Jota, I hope and think both of them will be fine but even if not I am not worried. Salah will definitely get it, I THINK Liverpool will explode at home this weekend after their disappointing performance at West Ham, especially as they are playing one of the worst defensive teams in the league. Few words regarding the chips, first thanks for the Geek who put my option as a third one. It’s an honour and for now I am sticking with my original plan WC30, FH31, BB32 and TC35/36, but I will decide only after the quarter final draw! Transfer summary: Alonso and Richarlison out for Kolasinac and Son HM in. Great week for me as the decision to take out Firmino for Aguero really paid off. Lots of green arrows everywhere so all good. Could have been better if Sane and Moura weren’t subbed this early but Sane was actually Citys worst player against Everton up to that point so cant really complain. 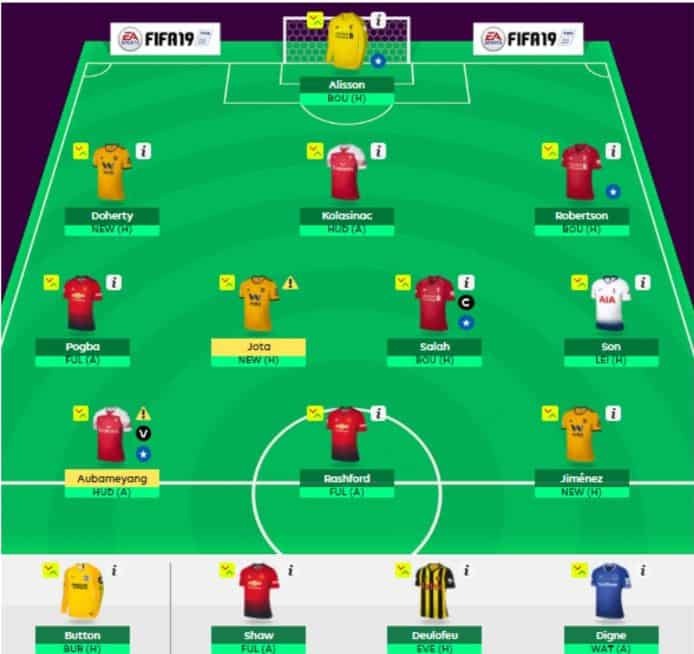 Moving forward – As I do not own a second wildcard having played it a few GWs ago I will start moving in players of the teams that do not have a blank. Having 3 Liverpool players is a must so I moved out Sane who has Chelsea and a blank next for Mane. That makes me owning Salah Mane and Van Dijk which is great Liverpool cover although they have dipped in form. Players from Newcastle, Bournemouth and Burnley will follow. I keep in the darkness with my fpl team after the third consecutive week in which I drop around 200K places, something that I had never experienced in the last 2 or 3 season playing this game. I came loser in the Pep roulette with Sane, I left good points in the bench, and the only positives were Hazard haul (finally) and Felipe Anderson back on top form. Good luck for GW26 geekers! 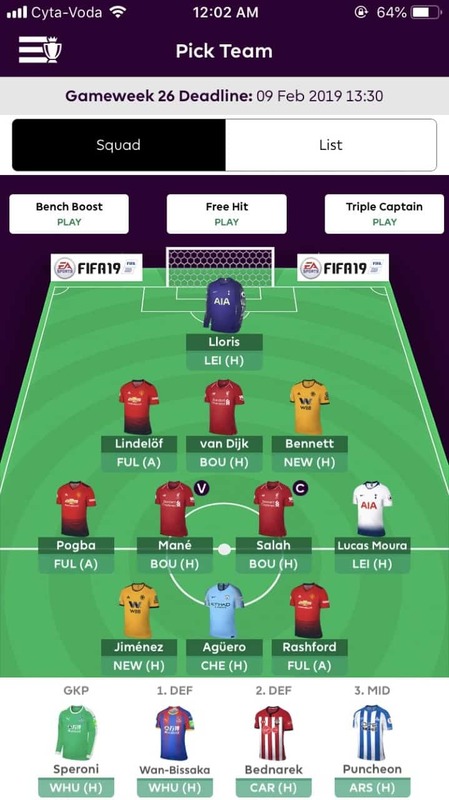 Need advice – I currently have 4 non playing players for next gw in aguero, Richarlison, Digne and Ederson. Option 1 – son + which keeper? Or 2 – gross and Alison? Next week will be aguero and Digne.